Anyway, the article seems to be the typical attention grabbing headline regarding the iPhone. I assume that CNN gets ALOT of traffic (and add dollars) when they have iPhone articles. I know I do – when I post something about the iPhone on this blog, the number of hits rises DRAMATICALLY!! I will update this post if the hits actually do rise in a significant fashion. So, the article is saying that most people like the AT&T service, even though the media makes it sound like AT&T is just terrible. Whether AT&T is terrible or not, is not what I am writing this post about, but rather the photo at the top of the article. The happy iPhone user in this image is not using AT&T. He is using Softbank. It is very clear from the credits and from the image itself that the user is not using AT&T and is located in Japan. 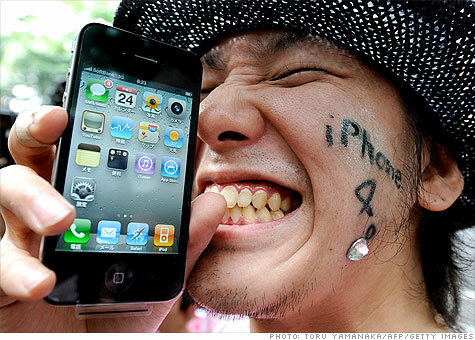 Softbank is the sole service provider of the iPhone in Japan — just like AT&T is in the USA. As I have traveled to Japan many times, and I have rented a Softbank sim card for my iphone 3G, I can attest that Softbank does indeed offer better service in Japan than I am used to in New York City. This entry was posted in electronics, iPhone, Phone and tagged AT&T, iphone, NYC, softbank, tokyo, Verizon on July 25, 2010 by Adam Noah.